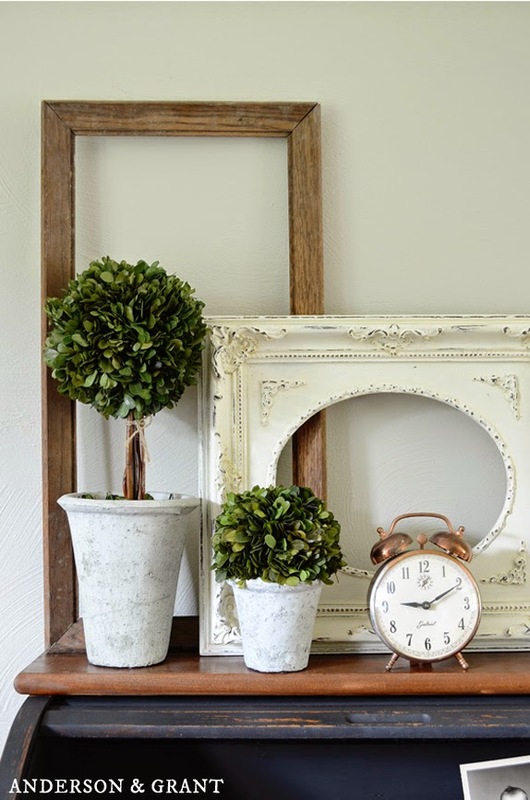 Decorating with empty picture frames can be a great way to add a little personality and interest to your decor without spending much money at all. When I was staging my desk to share with you a few weeks ago, I used a couple random frames to lean on the desktop. I realized that I use empty frames quite a bit in my decorating and thought I'd put together a little collection of some great ideas that I've seen. 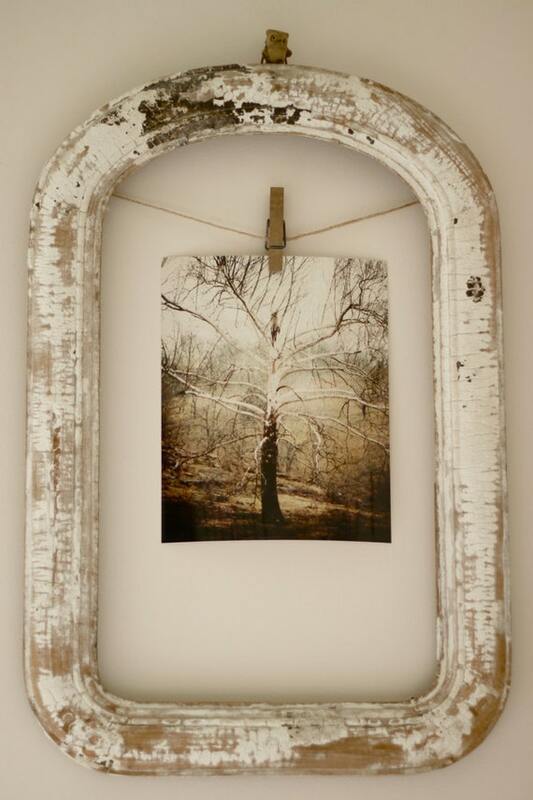 Empty wood frames can be picked up for a great price at thrift stores and yard sales. Many people do not see the value in something that no longer has the glass with it. You can find very basic, plain wood frames as well as ornate, decorative ones. If you plan on painting the frames, they can even be plastic or metal if you like the shape or detail. I picked up both of these for about $3 total, and then painted the white one. This is my favorite picture illustrating the idea of using empty frames. In this holiday display, not just one but two frames were used to hang a tiny Putz house with some greenery and gingham bow. The house would be lost in any grand display, but in this instance it really becomes highlighted. A frame does not have to have glass and a backing to hold a picture. A small string and wood clothespin suspend the photo in this frame. The picture is probably more noticeable displayed this way than if it filled the entire frame. Using empty frames on the wall adds architectural interest, much the same as moulding, but without any construction involved. This is just a random collection of different sized and shaped frames in the same color, but it really draws your eye up the stairs. 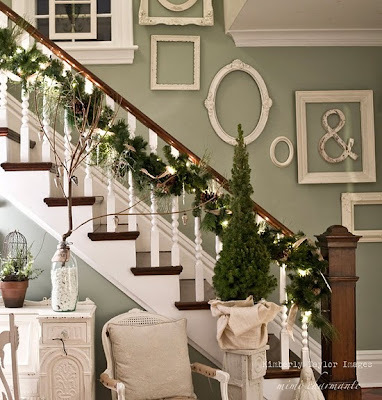 It is a great way to decorate the wall of a rental property, too! I think that we all have those narrow sections of wall that we don't know how to decorate. 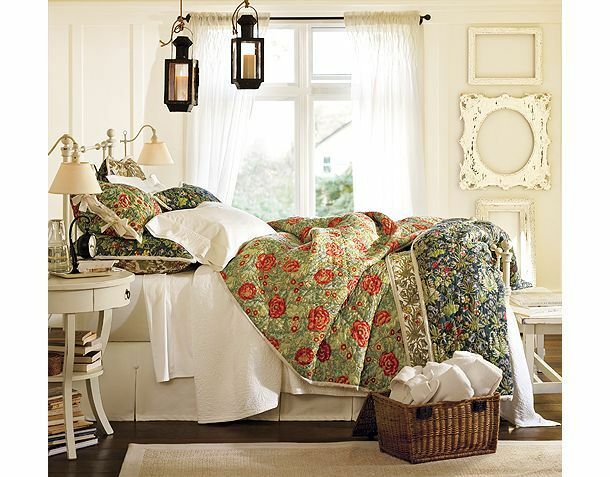 In this photo from Pottery Barn, three interesting looking frames were hung vertically to complete the entire space. 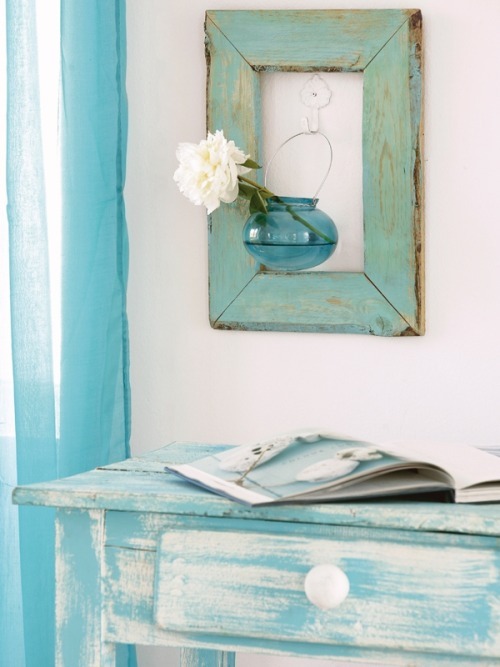 This frame has been repurposed for holding a little flower vase. The small vase with a singular flower could be lost sitting on the desktop, but becomes much more noticeable hanging inside the frame. 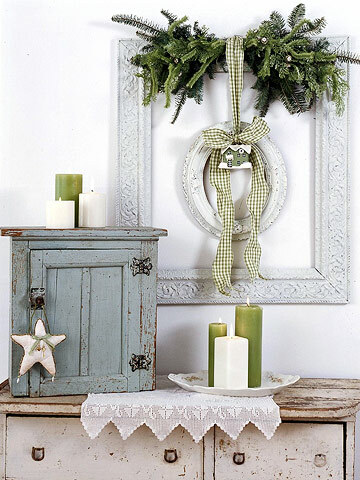 And for an idea that doesn't require any nails at all.....This frame is just leaning on the mantel with a wreath tied to it. Simple and beautiful! A collection of frames looks great sitting on a shelf or mantel overlapping one another. I really fills in the empty wall behind the pitchers, making everything in the display seem a little more important and grand. Using a frame or frames behind something doesn't just draw your attention to the frames, but to what you place in front of it. Just as a picture frame surrounds and enhances the photograph, an item placed in front of a frame is also enhanced. 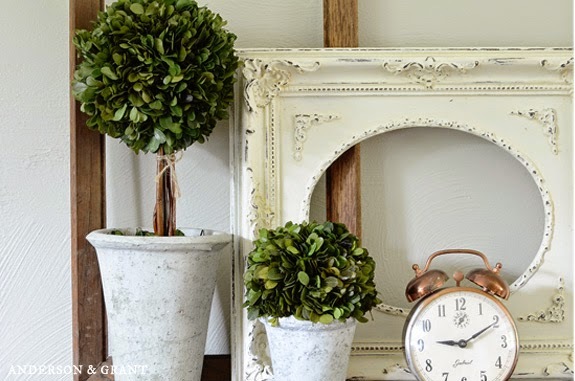 A frame doesn't actually have to stand or hang vertically to make a statement, either. 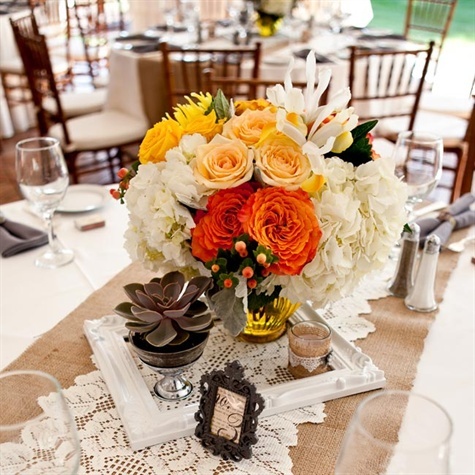 This picture is taken from a wedding, but a frame could be used as a centerpiece on your own dining table or around a collection on a coffee table. I love that it makes the individual containers on the table feel as one, cohesive centerpiece. So, have I convinced you to rush out and buy a few empty picture frames? I'd love for you to share ways that you've used them in your own home!